Panthenol easily penetrates the skin structure, binding and retaining water, whereby providing the skin with moisture, suppleness and restoring its elasticity. 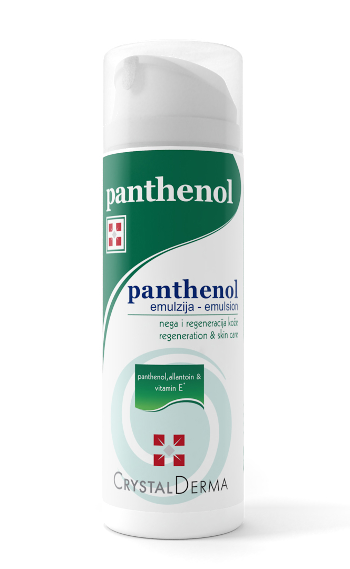 Moreover, panthenol mitigates signs of inflammation and stimulates epithelization. Vitamin E acts as antioxidant (protects cells from harmful effects of the environment), as emollient and humectant, additionally moisturizing the skin and making it soft and smooth. Skin care cream gel with panthenol is recommended for daily care of face, hands and body, for all generations. Panthenol cream gel has light texture that does not additionally make the skin greasy, wherefore it may be used for all skin types. It is safely combined with other cosmetic products. Allantoin is a product of protein metabolism in different organisms (bacteria, plants, mammals). The traditional use of comfrey, Symphytum officinale, for healing wounds and its long use in cosmetics and pharmacy, is based on the presence of allantoin. There is ample evidence on the effectiveness of allantoin as an active cosmetic ingredient. Allantoin is a mild keratolytic, moisturizer, anti irritation agent (binds and neutralizes many irritants and sensitizers), causes cell proliferation and stimulates epithelization, accelerates wound healing, relieves existing and prevents new stretch marks. It is a skin- friendly substance, used for protection and regeneration of intact skin in small abrasions, burns, rash and irritations. Grape seed oil is rich in essential, omega-6 fatty acids that stimulate skin regeneration. 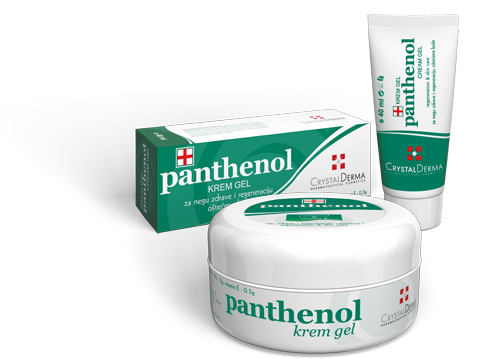 Panthenol rich cream is a modern cream-type W/O (water-in-oil) consisting of biodegradable substances.